A new European Commission-funded initiative aims to prevent falls by disseminating best practices and patient education. An organization of professional associations supporting the Digital Agenda for Europe aims to give European citizens access to their electronic health records. A program of the New York eHealth Collaborative is trying to establish a seamless exchange of health information across providers working with people who are mentally ill. These initiatives – ProFouDN, SUSTAINS and HEAL 22 – are but three examples of a growing trend called "connected health," which as far as buzzwords go, seems to have replaced "big data" as one of the most ubiquitous terms in the healthcare arena. Simply put, connected health is about connecting all parties involved in healthcare management and service delivery — patients, clinicians, data managers, mobile health product vendors, telehealth operators and the like —into a unified, standardized system. And it's not just about connecting everyone up within a particular healthcare system; it is also about connecting healthcare systems across nations and the world, according to panelists at the recent Digital Health Conference 2014 in New York City. In the session "Connected Health — Around the World in 60 Minutes," they discussed the challenges faced by their countries' healthcare systems and how new collaborations could help. "For most people outside the US, the changes taking place in the US healthcare system are a mystery," moderator Brian O'Connor, Chair of the European Connected Health Alliance (ECHAlliance), told the audience of IT professionals, CIOs, CMIOs, investors, entrepreneurs, academics and vendors. "Similarly, the healthcare systems of China and Europe are a mystery to people in the US," he said. "So what we're doing today is going on a journey to visit these systems, dispel the mystery and open the doors to opportunity." Millard Chiang, Chair of the recently formed China Connected Health Alliance (CCHAlliance) and Chair of Pegasus Holdings Group, provided a snapshot of China's patient population and highlighted key areas of concern. He noted that while chronic diseases such as cancer, diabetes, heart failure and hepatitis C accounted for 19 percent (260 million) of patients in 2013, the percentage will grow in coming years along with the aging population. People ages 60 to 65 currently make up 13 percent of China's population; those over age 65 account for an additional 9 percent. Together, they eclipse those under age 15 (16 percent). The dwindling younger population is due primarily to the one-child policy instituted in the 1970s, he said. But environmental factors – notably, air and water contamination from industrial products – are largely responsible for the more than a billion cases (81 percent) of non-chronic diseases among all age groups. "We need first-rate healthcare technology, operating systems and research — and we need one million nurses over the next five years," he said. Those needs, among others, drove Chiang and colleague Peter Chau to cofound the CCHAlliance, forming "a bridge" to Europe through collaborations with the ECHAlliance. The result is a variety of opportunities for companies involved in "ehealth, mhealth, telecare, phealth, digital health and related technologies," he said. For example, the CCHAlliance reached out through the ECHAlliance to the University of Ulster in Belfast, Ireland, for help with its nursing care needs. The university was chosen in part because it is home to a Confucius Institute, which was formed in 2011 to foster closer ties between China and Northern Ireland (Confucius Institutes operate in universities and other organizations throughout the world). Chiang credits networking with countries outside of China, as well as internal networking with China's ministries of health, social welfare and security, with the rapid success of the CCHAlliance's outreach efforts. "In eight short months, we've provided the possibility for more elderly care, as well as hospital and nursing care," Chiang said. He pointed out that China is the only country in the world with nationwide broadband, which enhances its ability to implement connected health solutions. He also credits the support and networking opportunities provided by GSMA, a global organization for mobile device operators, which produces the Mobile World Congress and Mobile World Congress Shanghai. Julien Venne, Strategic Advisor & European Project Team Leader for ECHAlliance, gave an overview of the healthcare situation in the 28 member states of the European Union. He noted that chronic diseases are the leading cause of mortality throughout the EU, and are responsible for 80 percent ($966 billion) of global health expenditures. These expenditures are expected to rise, as in China and elsewhere, due to population aging. Currently, about 20 percent of Europe's population is aged 60 or over; that will rise to 30 percent by 2030 and will include a large percentage of people over age 80. Venne acknowledged that each country in the EU has "different healthcare systems, different rules and different politics," although all follow a common principle: universal healthcare coverage with general practitioners as the main gateway to care. Because the EU cannot decide strategy for its members — it can only foster research and innovation — each member state has its own healthcare business model; generally, the model is a mix of public and private sector organizations that together make up the public health and social care systems. Contributing to the market fragmentation is the lack of interoperability among computerized systems and laws that differ from place to place. 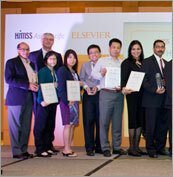 Even so, Europe presents opportunities for US companies working in the e-health space, Venne emphasized. "You need to create your own ecosystem to innovate," he said. 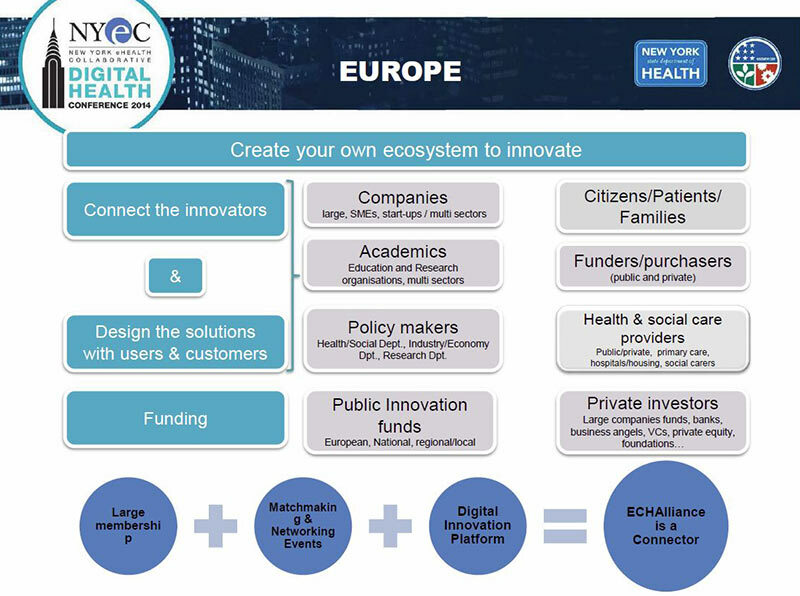 Referring to the slide below, he said the ECHAlliance will do its part by helping to connect innovators and their products with funders and purchasers, patients and families and health and social care providers. David Whitlinger, Executive Director of the New York eHealth Collaborative, told the audience that the US shares the concerns of China and the EU regarding an aging population and the costs of chronic disease. According to the latest figures, chronic disease is responsible for 80 percent of US healthcare spending, or $2.3 trillion. Passage of the Affordable Care Act could ameliorate the problem, he said, by "putting us on track to provide healthcare to all of our citizens, thereby bringing us in line with Europe and China." 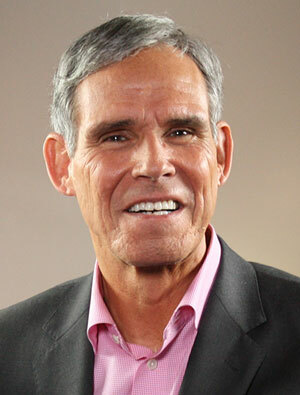 Also similar to Europe and China, the US Centers for Medicare and Medicaid Services continue to "shift from a hospital-centric system to healthcare delivery in ambulatory and home care settings, and from a curative approach to preventive care," Whitlinger said. "There's a move to pay for quality, outcomes, wellness — all opportunities for innovation if we can get healthcare ecosystems to align to a set of universal services throughout New York state and across the globe." Whitlinger concluded by observing that the ECHAlliance is a sister organization to the CCHAlliance, and that the New York eHealth Collaborative is a member of the ECHAlliance. Together, he said, the organizations "offer a window into the health status and needs of some 2.4 billion people on three continents, in markets that are spending north of four trillion US dollars." He stressed that the global market is ripe for "killer apps" that can scale across countries and be delivered via a "coordinated care/team-based approach" — for example, a "medication-adherence app" to support care plans or an app that could make a significant impact on obesity, exercise and other lifestyle changes. Right now, Alcoholics Anonymous and Weight Watchers are the only programs proven to work worldwide. We need killer apps that help solve these and other big health problems in New York, Europe, China and beyond. These organizations, represented by panelists at the Digital Health Conference 2014in New York City, welcome collaborators in all areas of digital healthcare. Marilynn Larkin is an award-winning science writer and editor who develops content for medical, scientific and consumer audiences. She was a contributing editor to The Lancet and its affiliated medical journals for more than 10 years and a regular contributor to the New York Academy of Sciences' publications and Reuters Health's professional newsfeed. She also launched and served as editor for of Caring for the Ages, an official publication of the American Medical Directors Association. Larkin's articles also have appeared in Consumer Reports,Vogue, Woman's Day and many other consumer publications, and she is the author of five consumer health books.